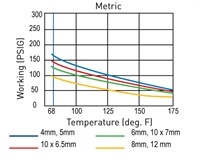 Although 95A Durometer is the hardest compound used for Nycoil's Polyurethane tubing, it is still flexible and has a smaller bend radius (without kinking) than most other plastic tubing. Produced from raw materials that resists moisture, fungus, abrasion and a broad range of chemicals making it a popular choice for many applications. A wide selection of colors makes it adaptable to the functional and aesthetic requirements of most pneumatic circuits and equipment. 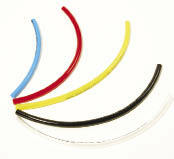 95A Durometer Polyurethane Tubing can be used with most brands of Push-To-Connect or Hose Barb Fittings. Adding a Color Code suffix to the part number is required. If no Color code is selected, Natural (0) color will be supplied. Custom sizes, cut lengths, reel lengths and colors are available upon request - contact Customer Service. 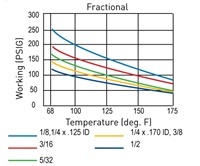 Please refer to the Technical Section for working pressure charts and chemical resistance.